Sparks literally fly when a sperm and an egg hit it off. 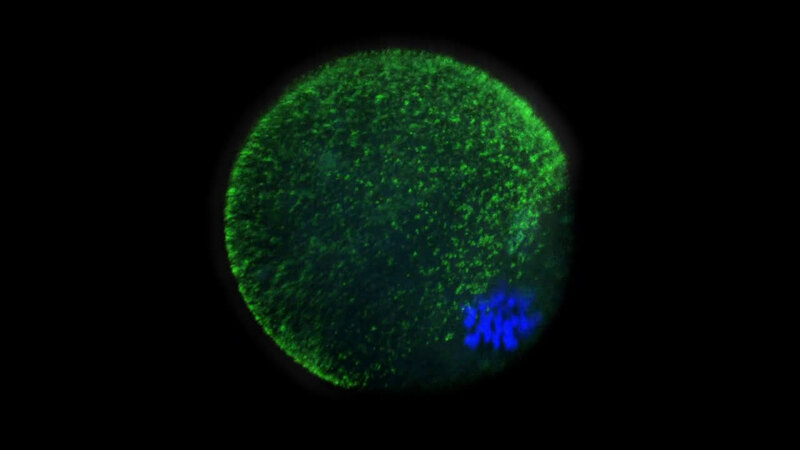 The fertilized mammalian egg releases from its surface billions of zinc atoms in "zinc sparks," one wave after another, a Northwestern University-led interdisciplinary research team has found. Using cutting-edge technology they developed, the researchers are the first to capture images of these molecular fireworks and pinpoint the origin of the zinc sparks: tiny zinc-rich packages just below the egg's surface. Zinc fluctuations play a central role in regulating the biochemical processes that ensure a healthy egg-to-embryo transition, and this new unprecedented quantitative information should be useful in improving in vitro fertilization methods. "The amount of zinc released by an egg could be a great marker for identifying a high-quality fertilized egg, something we can't do now," said Teresa K. Woodruff, an expert in ovarian biology and one of two corresponding authors of the study. "If we can identify the best eggs, fewer embryos would need to be transferred during fertility treatments. Our findings will help move us toward this goal." Woodruff is a Thomas J. Watkins Memorial Professor in Obstetrics and Gynecology and director of the Women's Health Research Institute at Northwestern University Feinberg School of Medicine. The study, to be published Dec. 15 by the journal Nature Chemistry, provides the first quantitative physical measurements of zinc localization in single cells in a mammal. The research team, including experts from the U.S. Department of Energy's Advanced Photon Source (APS), developed a suite of four physical methods to determine how much zinc there is in an egg and where it is located at the time of fertilization and in the two hours just after. Sensitive imaging methods allowed the researchers to see and count individual zinc atoms in egg cells and visualize zinc spark waves in three dimensions. 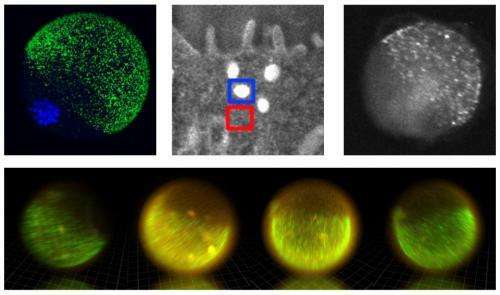 After inventing a novel vital fluorescent sensor for live-cell zinc tracking, scientists discovered close to 8,000 compartments in the egg, each containing approximately one million zinc atoms. These packages release their zinc cargo simultaneously in a concerted process, akin to neurotransmitter release in the brain or insulin release in the pancreas. These findings were further confirmed with chemical methods that trap cellular zinc stores and enable zinc mapping on the nanometer scale in a custom-designed electron microscope developed for this project with funding from the W.M. Keck Foundation. Additional high-energy X-ray imaging experiments at the APS synchrotron at Argonne National Laboratory enabled the scientists to precisely map the location of zinc atoms in two and three dimensions. "On cue, at the time of fertilization, we see the egg release thousands of packages, each dumping a million zinc atoms, and then it's quiet," said Thomas V. O'Halloran, the other corresponding author. "Then there is another burst of zinc release. Each egg has four or five of these periodic sparks. It is beautiful to see, orchestrated much like a symphony. We knew zinc was released by the egg in huge amounts, but we had no idea how the egg did this." O'Halloran is a Charles E. and Emma H. Morrison Professor in Chemistry in the Weinberg College of Arts and Sciences and director of Northwestern's Chemistry of Life Processes Institute. The study establishes how eggs compartmentalize and distribute zinc to control the developmental processes that allow the egg to become a healthy embryo. Zinc is part of a master switch that controls the decision to grow and change into a completely new genetic organism. The studies reported in Nature Chemistry are the culmination of six years of work and build on prior discoveries made by the Woodruff and O'Halloran labs using data from work performed at Northwestern and the APS. In previous studies in mouse eggs, this research team discovered the egg's tremendous zinc requirement for reaching maturity. In addition, the researchers determined that an egg loses 10 billion of its 60 billion zinc atoms upon fertilization in a series of four or five waves called "zinc sparks." Release of zinc sparks from the egg is essential for embryo formation in the two hours following fertilization. "The egg first has to stockpile zinc and then must release some of the zinc to successfully navigate maturation, fertilization and the start of embryogenesis," O'Halloran said. "But exactly how much zinc is involved in this remarkable process and where is it in the cell? We needed data to better understand the molecular mechanisms at work as an egg becomes a new organism." One major hurdle O'Halloran and Woodruff faced was the lack of sensitive methods for measuring zinc in single cells. To address this problem, they formed a collaborative team with other researchers in Northwestern's Chemistry of Life Processes Institute to develop the tools they needed. Key members of the team were Vinayak P. Dravid, the Abraham Harris Professor of Materials Science and Engineering at the McCormick School of Engineering and Applied Science, and Stefan Vogt, a physicist and group leader of microscopy at the Advanced Photon Source. Dravid and Vogt are co-authors of the paper. "We had to develop a slew of methods to be convinced we were seeing the right thing," O'Halloran said. "Science is about testing and retesting ideas. All of our complementary results point to the same conclusion: the zinc originates in packages called vesicles near the cell's surface." The researchers currently are working to see if they can correlate zinc sparks with egg quality, information that would be key to improving fertility treatments. Not only are these new imaging techniques important for describing the zinc spark, they can be applied to other cells that likely use zinc in a similar way, but whose workings remain elusive due to the lack of sensitive and specific tools. This study lays the groundwork for understanding how zinc fluxes can regulate events in multiple biological systems beyond the egg, including neurotransmission from zinc-enriched neurons in the brain and insulin-release in the pancreas. The title of the paper is "Quantitative mapping of zinc fluxes in the mammalian egg reveals the origin of fertilization-induced zinc sparks."